U.S. automotive designer born Audrey Moore in Plymouth, MI, she was probably the first full-time female designer at a major auto company. She studied fashion design at Detroit Art Academy starting in 1936, studied business at Detroit Business Institute, and then studied and graduated in 1943 from the University of Michigan’s industrial design program. While at school, she worked as a draftsman during WW II at the B-24 bomber plant in Willow Run. In 1944 Virgil Exner hired her as a female stylist at Raymond Loewy’s Studebaker design group in South Bend, a contact she had made through Joe Thompson, designer there. At Loewy’s, she worked on the 1947 Studebaker Champion’s interior and exterior components (see illustration), including the design of its much-imitated ‘torpedo’ hood ornament. 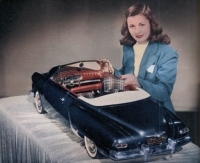 When Loewy’s Studebaker office shut down, she was hired in 1947 by Alex Tremulis to work in Chicago on interiors for the 1948 Tucker car, of which about 50 were produced before Preston Tucker’s production line was shut down. Audrey briefly lectured on industrial design at a veteran’s college. She then left the design field for a career in women’s fashions, as an international saleswoman and fashion advisor of foundation garments with the Formfit Company in Chicago for three years, and then for 15 years in a similar position at Bienjolie in New York. Later, she worked with her husband in a travel agency he started. 100 Years of Design consists of excerpts from a book by Carroll M. Gantz, FIDSA, entitled, Design Chronicles: Significant Mass-produced Designs of the 20th Century, published August 2005 by Schiffer Publications, Ltd. I own or have obtained the rights to the image(s) included with this article and grant industrialdesignhistory.com the right to post it(them) on its website and make use of it(them) in print media with proper attribution.